Early on in the writings of Christianity a type of travel literature developed around the framework of the pilgrimage. Such books described holy sites, and the experiences encountered en route lent some dramatic flow to the story. Bernard, author of 'Journey of Three Monks', was a Breton monk from Mont St Michel who, with Teodomundo from S Vicenzo in Benevento and Stephano from Spain, visited the Holy Land about 870. 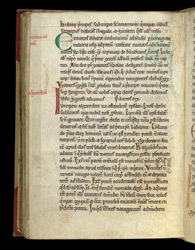 This late 12th-century copy belonged to Fountains Abbey, where his account of the holy places would have been read for entertainment and to inspire spiritual recreations of the shrines in North Yorkshire. On this page they are getting underway, having left Bari and on their way to Taranto which, along with North Africa and the East Mediterranean, was under the rule of the Saracens, making it necessary to travel to Alexandria to get the permission of the representative of the Emir-al-Mumenin to travel. At Taranto, the sight of 9000 Christian slaves from Benevento held aboard three ships awaiting departure for Tunis and Alexandria impresses upon him the gravity of the situation. He tells of nearly draining the monks' financial resources to insure safe travel.